A major figure on Bondi's hospitality scene is set to hit the market, following a slew of high profile A-grade asset sales across Australia. 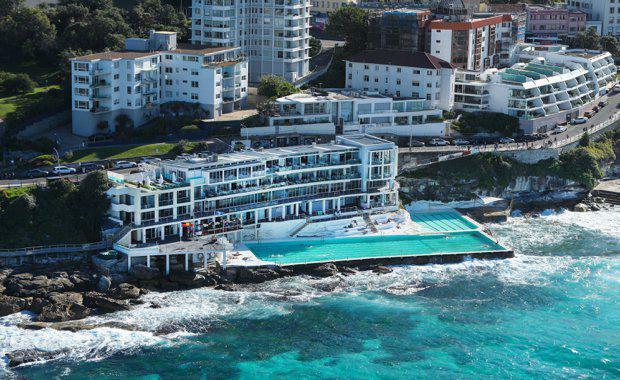 Ray White, on behalf of assets owners John Singleton, Geoff Dixon and Mark Carnegie, is set to sell the Level 3 Icebergs Dining Room and Bar, a 675 square metre top floor operation perched high above Bondi Beach. The Icebergs Dining and Bar team has a lease with John Singleton's company until 2036. Singleton, whose property enjoys clifftop uninterrupted 180 degree views of the Pacific Ocean has a lease until 2042. A price tag of upwards of $15 million is expected. "We wholly expect interest in the sale process to be both domestic and, given the unrepeatable nature of the offering, international; with a combination of astute investors and those with an appreciation of the significant hospitality opportunity presented by John's decision to sell the asset at this time," Ray White Asia Pacific director of hotels Andrew Jolliffe said. Singleton, who once lived opposite the legendary beachside Icebergs building and swam there regularly, made a promise to the management over 25 years ago to completely rebuild the premises after it was found to contain concrete cancer. "We now have an institution that the community, politicians, swimmers, diners and NSW and Australia can be truly proud of," Singleton said. "It is etched in the Aussie ethos of helping your mates, doing your bit and providing something for future generations not only to be proud of, but to reflect on what we had to do to make this great place even better. "It's a true living example of community spirit, and if you go there on any given day, you can't help but notice what it means to the community and its members," he said. Jolliffe, who has recently sold waterfront hospitality properties including The Newport Arms, Clovelly, Collaroy and Crown Plaza hotels on Terrigal Beach, yesterday added to the raft of impressive oceanfront sales by announcing the sale of the Patonga Beach Hotel opposite Sydney's affluent Palm Beach. "Waterfront hospitality offerings are, frankly, so very rare in terms of the inherent barriers to entry for suitable replacements, that they rightfully enjoy the most revered of reputations from sophisticated investor groups and indefatigable loyalty from their respective patron bases," Jolliffe said. Australia's hospitality industry has been awash with high profile sales of well-known A-grade operations, with national market leaders such as Justin Hemmes' Merivale Group and Bruce Solomon's Solotel Group acquiring a number. The sale of the Icebergs Level 3 asset is being conducted via an international expressions of interest campaign concluding October 12, 2017.